For west coasters in particular, Hawaii has long represented a slice of vacation paradise. And what is not to like? No matter the island you choose, you are pretty much guaranteed great weather, beautiful scenery and gorgeous beaches. My own travels have taken me to the Big Island, Kauai and Maui – and now, as of a week ago, Oahu. However, while I thoroughly enjoyed hiking inside volcano craters on the Big Island, soaking up the relaxed small island vibe of Kauai and watching whales frolic off a Maui headland, it is this past trip that seems to have imprinted the most memories. Perhaps it is because my visit is still fresh in my mind, or my kids are substantially older than our last Hawaiian vacation. Or perhaps it is simply because the island offers up so many things to see and do. Regardless, Oahu can be a great vacation if you are looking for some fun in the sun with elementary, kindergarten or pre-school age children. 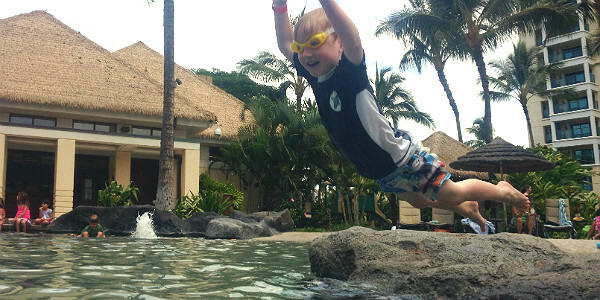 Here are my top recommendations for active young families looking for a full Oahu experience. If you want to remove yourself from the hustle and bustle of Honolulu and retreat to a quiet self-contained paradise away from the crowds, you should make Ko Olina your home base. 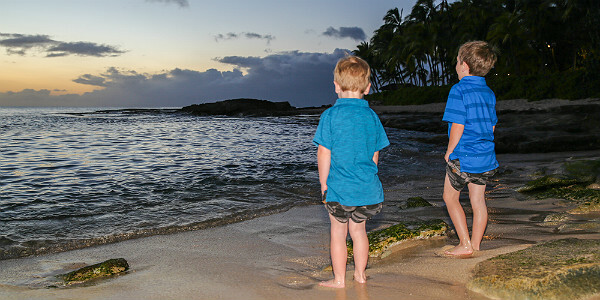 Located on the West Coast of Oahu, and built next to a string of man-made lagoons that provide tranquil waters that are perfect for kiddie water play, Ko Olina is still within easy striking distance of the city (25 minutes by car), as well as regions like the North Shore (45 minutes by car). The area offers plenty of dining options and multiple beaches – all accessible by foot, using the paved seaside pathway. There are also accommodation options for every taste: whether you prefer the small, 4-star JW Marriott Ihilani property with its shark and sting ray ponds, or Disney’s 3 year old Hawaiian flagship resort, complete with Mickey Mouse, waterslides and a lazy river. Alternatively rent a 2 or 3 bedroom “villa” at the luxurious Ko Olina Beach Villas Resort or stay in one of Marriott’s Ko Olina Beach Club apartments, which are equipped with a kitchen, dining area and living room, and include complimentary daily activities. Forget sports fishing or whale watching, the newest attraction to Oahu is Hawaiian Pirate Adventures. Climb aboard the Treasure Seeker and join Captain Hammerhead Alan as he and his 3-man crew go searching for treasure in the open seas. The unique thing about this particular pirate experience is the level of child involvement. While the pirates are actors, it isn’t a sit and watch show. 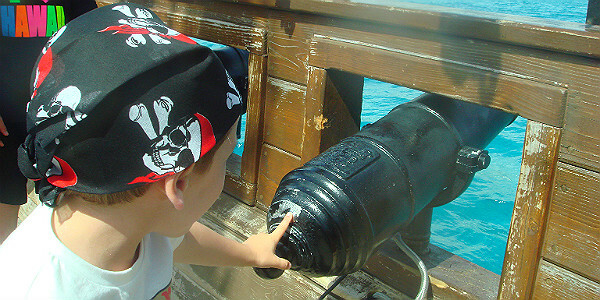 You and your child will be asked to channel your own inner pirate, helping man the water cannons (so you can fire at passing vessels), not to mention engage in other pirate behavior such as sword fighting and head tossing (don’t ask). There are a number of luau options on Oahu. But, whether or not you are staying in Ko Olina, Paradise Cove is definitely one you should visit. Well run and delightfully entertaining, you will walk away feeling like you have had a true taste of Hawaii. More importantly the 4 and a half hour experience, which includes everything from cultural demonstrations, food buffet, performances, hands-on arts and crafts, spear tossing and outrigger canoe rides, is worth every penny. You can’t make a trip to Oahu without visiting Honolulu; Hawaii’s capital. As one might expect, there are plenty of things to see and do here. For instance, a trip to the beachside neighborhood of Waikiki will not only reveal the infamous Waikiki Beach – with its small, long rolling waves, offering the perfect training ground for your child to learn to surf – but also a ton of designer shopping options. Here, recognized surf brand Quicksilver operates a store alongside the likes of Salvatore Ferragamo, Dior and Louis Vuitton. 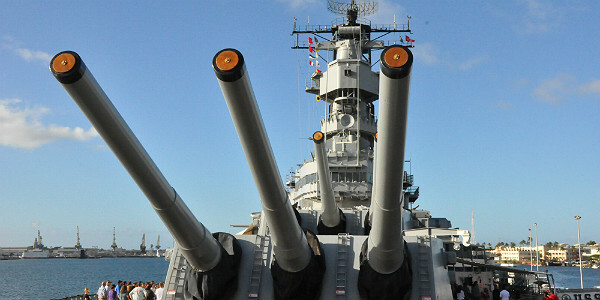 Nearby is Honolulu Zoo and a short drive back toward Pearl City you will find the USS Arizona and Mighty Mo at Pearl Harbor; the site of the United States entrance into World War II. However if you want to visit the USS Arizona memorial, you should book in advance. Also remember that while strollers are permitted, no bags or rucksacks are allowed into Pearl Harbor. The North Shore is tranquility at its best. Veg out watching the surfers ride the Banzai Pipeline at Ehukai Beach Park, build sandcastles at Waimea Bay and see where big wave surfing began, or make the short walk out to nearby Waimea Falls. If you are on the North Shore around sunset, parlay your visit with a fresh fish dinner at Jameson’s By The Sea. But try to make a reservation in advance as there are only a couple of restaurants in this region. Whether it is an iPhone, a little Sony point-and-shoot or a fancy Canon, you are going to want to keep a camera with you at all times as there are photo opportunities at every turn. Make sure you are charged up and don’t make my mistake of finding out halfway through a luau that your memory card is full. If photography isn’t really your strong suit, or you are sick and tired of always being behind the lens of your family vacation photos, consider reaching out to Pacific Dream Photography. They have perfected the art of capturing beautiful family moments on film and have a number of purchase options, depending on your budget. How To Get There: Honolulu International Airport (HNL) is approximately 10 miles from Waikiki, six miles from downtown Honolulu, 20 miles from Marriott’s Ko Olina Beach Club and JW Marriott Ihilani. Unless you’re planning to just keep within walking distance of the hotel you’re staying at, you’ll probably have to rent a car. Buses number 19 and 20 will take you from the airport to either downtown or Waikiki, and costs $2.50 each-way for an adult. Information regarding area transportation is available here. Best Time To Visit: Hawaii is located in the tropical region, so the seasons are warm and dry during the summer, and warm and wet in winter. If you’re looking to save money, consider Hawaii’s shoulder seasons, which is the best time to visit, weather wise: early or mid-May to mid-June, or September to early December. During this time, the average daytime high is in the mid-80s and the sun is out most of the time. The best deals for airfares and hotels can be had during this time. The high season on the islands is between mid-December and late-March or mid-April. During this time, the beaches and attractions will be crowded, and airfares and hotels will expensive and potentially hard to come by. June to August is a popular time for family vacations, but overall prices are more reasonable than during the winter months. 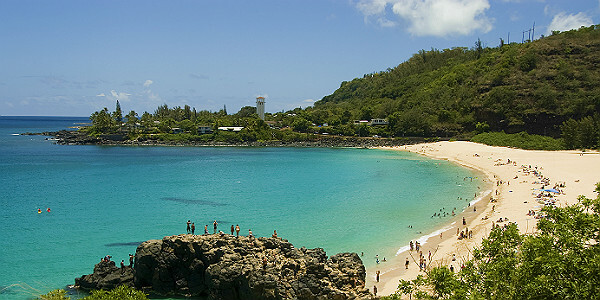 Hawaii is also a popular destination for Japanese tourists. From mid-April to mid-May, there’s typically an influx of Japanese tourists, due to Japan’s Golden Week, when three holidays take place one after another.